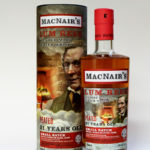 This entry was posted in Blog, New Whisky Releases and Bottlings and tagged Adelphi, Bowmore, Glen Grant, Macallan, Single Malt on 4 September 2010 by Mike. We have received in three new exceptional Adelphi's from their latest bottlings. This whisky is all about Snickers bars and ice cream sundaes with butterscotch sauce. Fabulous. This is from a refill sherry cask. A combination of warm fruit pie, honey and nuts with chocolate orange. A classic old style Macallan. Lots of mint toffee, tar and coal dust. A real minty surprise for a Bowmore and well worth a try.